In a polygon tiling game, you are required to fill a polygon with a set of basic shapes called tiles. This is equivalent to cutting up the entire polygon into a number of small pieces; each piece must have exactly the same shape as one of the provided tiles. Let us consider a simple version of the game. 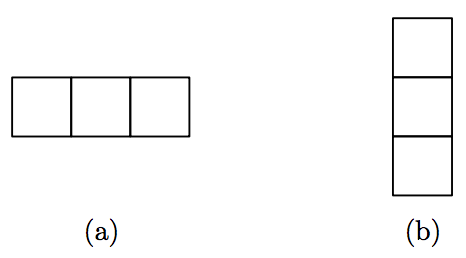 Two types of rectangular tiles are given as shown in Figure 7. Their width/height are 1/3 and 3/1 respectively. You are asked to use these two types of tiles to tile a rectilinear polygon (that is, a polygon with only vertical or horizontal edges). For instance, Figure 8(a) shows such a polygon and Figure 8(b) shows how it can be properly tiled with three 3 × 1 tiles and one 1 × 3 tile. A polygon is always positioned in such a way that its lowest edge is on the x-axis and its leftmost edge is on the y-axis, as shown in Figure 8. A polygon is represented by an ordered list of points that enumerates all of its vertices. The enumeration starts from the lower-left vertex (i.e. the leftmost vertex lying on x-axis) and proceeds counterclockwise. For instance, the polygon in Figure 8(a) is represented by the sequence of points [A, B, C, D,E, F, G, H]. A grid (a rectangle whose width and height are both one) is represented by a pair (x, y), where x and y are the x-coordinate and y-coordinate of its top-right vertex. In Figure 8(a), the coordinate of every grid is indicated inside the grid. A tile is designated by a triple (x, y, z), where x and y are the coordinates of the middle grid of the tile and z represents the orientation of the tile. If the tile is horizontal, then z = 0; otherwise z = 1. Figure 9 gives two examples. Your task is to write a program that finds a way to tile a given polygon. The polygon is known to be tillable. If there is more than one ways of tiling, you are only required to find one of them. Each case describes a polygon to be tiled. The first line contains a single integer N (4 ≤ N < 100) that denotes the number of vertices of the polygon. The subsequent N lines specify the vertices of the polygon in the order stated above; one line per vertex. A vertex is specified as its x-coordinate followed by its y-coordinate, separated by a white space. You may assume the area of a polygon is always less than 1000, as well as each coordinate value is an integer less than 100. A line that contains a single zero indicates the end of input, and this line should not be processed. The sample input below denotes the polygon shown in Figure 8(a). For each case, the output produces a list of tiles that fills the polygon specified in the input file. A tile is specified as a triple x y z as described above, separated by a white space; one tile per line. The tiles may appear in any order. The sample output below represents the solution shown in Figure 8(b).